Okay, so I guess this apple pie filling isn't from scratch. But it's close. And if you use ripe, blushing apples and grate your own cinnamon and nutmeg, it almost tastes as if you could spin around and glimpse the Garden of Eden. So here's the apple skinny: this project is perfect for new cooks and first-time canners. Really. If you follow this recipe, you'll end up with the equivalent of six heaping quart jars of apple pie filling. Make it with a friend and split the difference. Make it by yourself and hoard it for potlucks and July Fourth and pretty weekends. Give it as gifts. This stuff goes far, I'm telling you. Besides, the benefits of pre-made pie filling are many. Convenience is one. This July when it's too hot to boil water? Simply dump your filling in a crust and bake. Brilliant. Plus, this smooth filling is pre-shrunk, meaning your pies will make lovely, towering slices which could even boast a lattice top or decorative, fluted pastry covers. 1. Take 20 apples - any varieties you like. I like Gala and Granny Smith because that's what I get down in Texas, but Jonagolds or Winesap or any local variety you love will likely work. Wash your apples and peel, core, and slice them. Dump the slices in a large bowl (or bowls) filled with water and a teaspoon or two of lemon juice to prevent them from browning. 2. Next, in a large saucepan, combine: 10 cups water, 5 cups sugar, 1 cup corn starch, 2 1/2 teaspoons cinnamon, 1 teaspoon nutmeg, and 1 teaspoon salt. Bring to a boil and stir it until it makes a thick, caramel colored sauce that pours slowly from your spoon. (It takes about 12 minutes. Maybe 15 if your stove is cranky.) Remove pan from heat and stir in 3 tablespoons of lemon juice. Of course, you don't have to can your filling. Use it right then, between homemade or ready-made pie crusts, to make six apples pies. (Or reduce the recipe to make just one.) You could try freezing your filling in quart-sized bags, but know that you'll likely need to cook your apples first, or plan to simmer them later, before you assemble your pie. However you choose to go about this, I promise you one delicious, straight-forward American apple pie. And truly, what could be better? I'll admit: I love this recipe. The idea came from a MaryJane article I found a few years ago, and I've made it every year since. I love these apples spooned over ice cream. I love them baked under shortbread for a sort-of Apple Betty. I like to eat them straight out of a cold, refrigerated jar. In short, it's worth the effort. It looks magical. Sounds magical AND a titch labor intensive, too. Thanks for the recipe, Brin! I'll try it in September when the new apples are fresh from the orchard. Thanks for the recipe Brin. 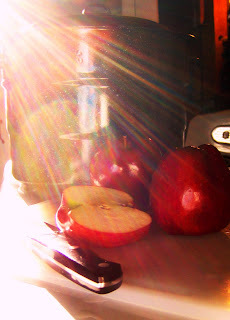 OH, and the photo of the 1/2 apple with the sun streaming thru is brilliant! LOVE that photo! Yum! I'm going to try this as soon as I have time. Although that probably won't be for a few weeks. Drat! This is now on my to-do list. I'll let you know how it goes. YUMMO! This will be the first thing I can once we get moved and settled, as my clan loves apple pie, thanks Brin! Sorry y'all. Thanks for catching the fact that I totally blew by the water bit. Yes, 10 cups water. And it is corn starch and not corn syrup. Hehehe, and you are still young! I remember when I could type, talk on the phone, and keep an eye on what was going on around me. No more. Thank you for another great recipe. I can't wait to try this. It would make a great gift, too. 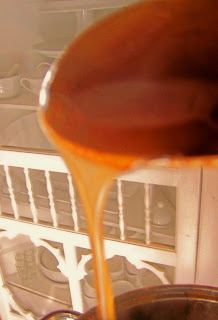 How golden and light the caramel sauce looks in this recipe. Can't wait to try to make this and bake a pie that I know my Dad will love. His favorite is apple turnovers, but I think he'll be very happy with this too. You're the best Brin! That said, would the pampered chef apple peeler corer thingy work for this? (I have one from years ago when I taught school - and I know she would get a charge out of using it). My Grams used to serve us hot apple pie filling with pork chops or chicken breasts for a treat (may sound pretty odd - but my, oh my - I can almost taste it now)! When you can the apples this way, what kind of a shelf life do they have (6 months, a year ...?). So can you use this recipe for peaches too, or does it ony work with apples? 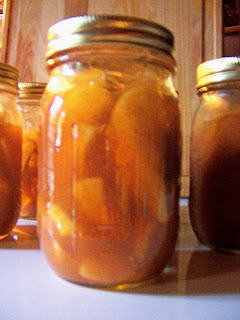 Ok, so I am totally re-inspired to try canning. I did it one season many many moons ago. And at a young 20 something, found it entirely too much like hard work. Maybe I'll be more comfortable with it now. Thanks for the great recipe! Dear Brin, if you ever decide to publish your cookbook, you don't need no stinkin publisher. Print the books yourself, take orders here and on etsy, and I know you'll sell tons! I'm in the midst of making this recipe and am afraid something has gone very wrong. I began to boil the water ahead of time, given it was 10 cups. Then I added sugar,cornstarch, and spices.It is not melding together.There are huge clumps of what I'm guessing are cornstarch and sugar that will not dissolve. Any chance of getting any help to understand how to remedy? Thank you! I just thought I'd let you know that I've been dying to make this pie, but just don't seem to ever have time to do crust, so today, since I had a bunch of apples to use up, I made enough for two pies, put it in a large casserole, and topped it with the topping for that Peachberry crunch you referred us all to, and it's baking now. It smells in-cre-di-ble!! I can hardly wait to eat it!! sorry to be the bearer of bad news. please do report - she has stolen from many, many bloggers and should be taken to task.